Recruitment process undergoes several stages of the interview. And those stages of the interview can be differentiated in terms of a particular extraction process of skills. That is why, most of the candidates prepare themselves for such interview processes in advance. But the thing they ignore during preparation is “how to introduce themselves to the recruiters”. It might seem as a piece of cake, but its better to be prepared as the saying goes like “first impression is the last impression”. Most of the candidates prepare their way of self introduction and rehearse their presentation. But some require a little improvement in this area. And those improvements are mentioned below. For a start, the candidate requires to smile and greet all the interviewers sitting on the panel. The candidate should smile even if he is feeling nervous from inside. Because his smiling face brings a good start of the conversation. While greeting the interview deliver a firm handshake saying “Hello”, “Good Morning” or any other greeting. While greeting, the candidate is supposed to mention their name and the place to start a formal introduction. Some candidates confuse themselves with the place thing, but the candidate should know that mentioning a place where they are from, actually helps the employer to understand everything. Moreover, the place doesn’t include a whole address. Therefore, a candidate should keep their starting stage clean and precise. The self introduction starts with a manner of the candidate shown in front of the recruiters of the company. Therefore, the candidates are required to wait for the permission of the recruiter. Most commonly the interviewers permit the candidate, right away after the greeting and smiling. Sometimes at the start of the conversation during the interview, the interviewing panel might be interested in knowing about the candidates’ family history. And for that sake they directly approach the candidate and ask them about their family and all. At that time, the candidate should be comfortable speaking about it and provide necessary family details. Every job description provides details about the type of job and the candidates’ requirements within the job description. Therefore, at the time of self introduction the candidate should also mention about their educational background. Explanation about educational qualification requires a precise and crisp manner. There should be a certain way of talking regarding educational qualification because the candidate can’t go on and on about their achievements in academics. While starting a self introduction, the candidate should be confident about his achievements in the field. Moreover, all the necessary information about the previous job profile should be explained in a positive manner. Additionally, the candidates should avoid talking negative about their previous employer. As, such type of behavior is unacceptable in the field of professionalism. All the candidates trying for a job in the company should keep in mind to talk smartly during an interview. After the conversation goes to the highest level, such as work profile, then the candidate takes that opportunity to explain them about the skills and talents that the candidate used to complete the project. All the necessary highlight of the projects should be displayed in a smart and precise manner. Most of the time during an interview the candidate keeps explaining about themselves to the employer. That seems a quite self obsessed for most of the people. Therefore, instead of talking about themselves the candidate can change the conversation context. Start talking about their company support and the admiration he received from his mentor for the work. This kind of behavior can be refreshing for the employer. Nowadays, job interview has become more comfortable and communicative. Therefore, all the candidates should be calm during their interview sessions. The only thing that candidate should understand is, how to grow from that situation. Therefore, the candidate should converse about the life goal and dreams that gives him confidence in life. Which encourages him to keep going every day and much more stuff. Most of the job profile requires a person who is positive with their life. Moreover, there will be very few companies who would like to talk about the candidate fun time at home or with friends. Apparently, the current situation brings a scenario of employment in a more creative way. And for that, the employers make a little more effort to understand the candidate and their life style. During interviews the candidates should keep their calm and focus on being confident. And at the time of communication if the recruiter asks you such question as explain your professional skill if any. Then, the candidate should explain professional skill that they acquired with the help of their educational background. Also about their skills gained because of their previous job experience. At the end of the interview session, the candidate should try to show his gratitude towards the employer for such great opportunity. The candidates can conclude their conversation by saying their ability to handle the job. Moreover, they can also try to convince the employer that they only deserve the post than anyone in the room. And finally, leave the room by saying thank you with a firm handshake along with a smile. All the above mentioned points provide a detailed information about the topics discussed during the interview. Additionally, this information can help those candidates during the interview while presenting their skill and qualities. But here are some additional information about self introduction in terms of their body language. 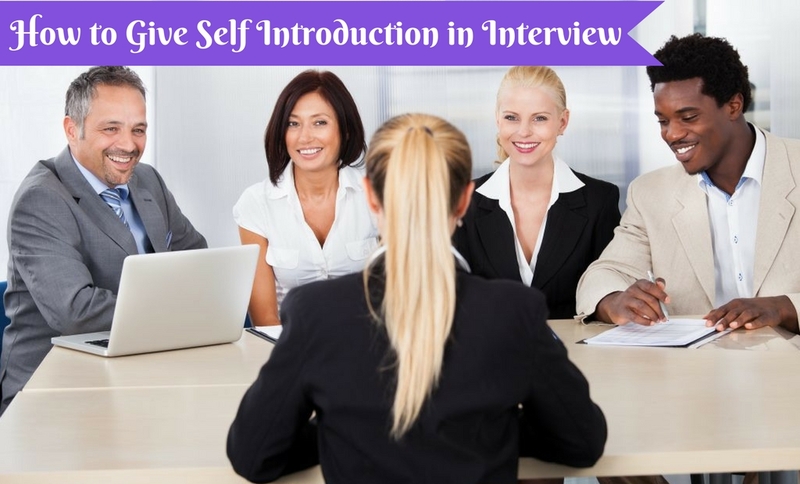 Every self introduction during an interview should be clear and precise. All the matters discussed in terms of self introduction of a candidate should be valued. Therefore, the candidate should avoid mentioning unnecessary things while they deliver their self introduction to their employers. It is obvious to experience a little tension or nervous before the interview. And for that sake most of the candidates rehearse their interview sessions in front their friends or all by themselves. Practicing all these measures provide a crisp view about their body language during the interview. Therefore, each candidate attending an interview should maintain a firm and positive body language. Most of the candidates experience pressure before, after and during the interview. But instead of feeling all this pressure on themselves they can at least think of their ability and hard work to reach a position in their life. Therefore, all those candidates trying for a job should keep themselves positive and calm. And if they feel nervous then take it as a good sign of excitement before the interview. It is necessary for all the candidate, to learn how to behave and present themselves during the interview. And for that sake the first and foremost thing they should learn is, how to have a good eye contact. Sometimes it happens that because of nervousness the candidate avoids having an eye contact with their employers and such kind of behavior can cost them that job. So it would be advisable to all the candidate attending interview that, no matter how nervous you are in an interview, always try and have a good eye contact. At the start of an interview the candidates should stand before the interviewers as a token respect for their position. Giving respect during an interview doesn’t make a person weak or small. Actually, the respect is for the employer’s achievement and his position in the company and not to impress him with the tactics. A candidate will receive respect from the employers if they have willingly given them back the same respect. Most of the interview takes place in a room or a hall. Therefore, the candidate should be seated in a position where the recruiter addresses them to sit. On the other hand, if it is a group discussion all the candidates will be seated in a oval table format. Moreover, during interview the candidate should maintain a position without showing over excitement by changing their positions in the interview room. Most of the candidates should list out some of the habits they have which can cost them that job. And after listing it out, they should think of handling them without any additional change. Some of the candidates have a habit of reaching at a place very late. But during an interview and especially when it is an interview appointment, then the candidate should reach the place an hour before the scheduled time. Therefore, all candidates should avoid being late during their interview because most of interviewers respect time and they do not appreciate late comers. Every interviewer expects a certain quality in their employees. And during any interview the interviewer searches for those qualities within their candidates. But some of the candidates show a negative side of their character by presenting negative opinions about their previous employers. During any interview talking bad about their previous interviewer is a big NO and No. Some candidates are deliberately being arrogant during their interview. And such kind of arrogance can cost them that job. Therefore, all candidates should keep in mind that if an employer is pushing your patience, then it doesn’t mean he is being rude to you. On the other hand, he is trying to evaluate your abilities to face such situations. Therefore, all candidates should face everything with a big smile on their face. Before going for an interview it would be best for the candidate to switch or their phone or keep it in silence for some time. Because if they forget to do so, then during an interview they will be occupied with a thought of their cell phones. And that can be a negative point for the candidate. Therefore, all candidates should be aware of these things. There is a way of attending an interview and also there is a dress code for all interviews. And that dress code is formal. If a person is getting ready for the interview wearing any cloth, then they should drop that plan on attending that interview. All candidates must know that for all interviews or professional meeting a person should carry himself with a formal manner. Some people have a habit of jumping into a conversation without letting the other person complete their sentences. And end up being in trouble for such kind of their behavior. Perhaps, people attending an interview should control their such habit because it can cost them a negative impact on the job. Therefore, candidates should have patience and let the interviewer complete their question or opinion and then express their opinion about the question. Finally, the bottom line is that the interview sessions stages different level of competition among all the candidates. Apparently, all candidates should understand how to approach their recruiter without being negative. Follow the above mentioned elements that can provide you better understanding about such matters of self introduction or tell me about yourself during an interview. Previous articleCognitive HR – Where This Technology Impacts The Most?